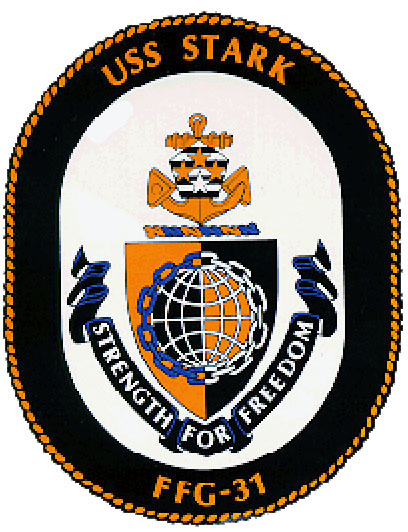 USS STARK is named for Admiral Harold R. Stark, who served his country with distinction for four decades. Born 12 November 1880 in Wilkes-Barre, Pennsylvania, he attended public schools and the Harry Hillman Academy before receiving his appointment to the U.S. Naval Academy. Following graduation in 1903, he served on many ships, including the battleship USS MINNESOTA, while she steamed with the "Great White Fleet" on the famous December 1907 to February 1909 cruise around the world. In June 1917, he reported for duty at the Naval Torpedo Station, Newport, Rhode Island. Shortly after the United States entered World War I, Stark assumed command of Torpedo Flotilla, Asiatic Fleet, but was soon transferred to the Staff of Commander, U.S. Naval Forces and operated in European waters for the remainder of the war. Stark earned a Distinguished Service Medal for boldly leading a squadron of small, old destroyers through monsoons from the Philippines to Gibraltar. The ships arrived ahead of schedule, and carried out an active role in the anti-submarine campaigns in the Mediterranean and the Atlantic. In the years following WW I, his service included assignment as Aide to two Navy Secretaries, command of battleship USS WEST VIRGINIA, Chief of the Bureau of Ordnance, and Commander of Cruiser Division Three, Battle Force. Stark attained the rank of Rear Admiral on 2 November 1934, and was promoted to Admiral on 1 August 1939 following his appointment as Chief of Naval Operations on 1 April 1939. Admiral Stark's second Distinguished Service Medal was for his resolute decision to hasten the capital ship construction for the "Two Ocean Navy," which proved a key to victory in WW II. In cooperation with Great Britain, he instituted effective trans-Atlantic convoy protection, as well as anti-submarine warfare measures which bridged the Atlantic from both North and South America. In March 1942, he took command of U.S. Naval Forces in Europe, thereafter providing the primary liaison between the British Navy and U.S. Navy for logistics for the British Isles. This included the massive staging, training, and logistics for the 2,904 U.S. Naval ships and craft, and the 124,000 naval personnel participating in the Normandy Invasion. Although he did not participate in the actual amphibious assaults on the Normandy Coast in June 1944, his personal contributions resulted in the award of a third Distinguished Service Medal. General Eisenhower additionally presented Admiral Stark with the Army's Distinguished Service Medal for rendering brilliant and distinguished service, not only as a naval administrator, but as a skillful diplomatic emissary in relations with Allied authorities, directly contributing to the liberation of Europe. In Autumn 1945, Admiral Stark was assigned to the Office of Naval Operations, Navy Department, Washington, D.C. He served there until he retired 1 April 1946. His many U.S. awards and decorations were supplemented by numerous honors from foreign governments, including Britain, France, Brazil, Norway, Poland, the Netherlands and Belgium. Admiral Stark settled in Washington, D.C., where he remained active in a variety of Navy organizations and clubs. He died 20 August 1972 at the age of 91. His wife, the former Katherine Rhodes, also of Wilkes- Barre, predeceased him. Description of Coat of Arms: Gold and blue are the colors associated with the Navy. The globe refers to Admiral Stark's global outlook of the U.S. Navy, which began early in his naval career when, after graduation from the U.S. Naval Academy, he sailed around the world with the U.S. "Great White Fleet." The globe further alludes to Admiral Stark's World War I experience as Commander of a Torpedo Flotilla, which he led from the Philippines to the Mediterranean Sea and Atlantic Ocean, which took an active part in the anti-submarine campaign. The chain encircling the globe symbolizes the U.S. two-ocean concept foreseen by Admiral Stark while Chief of Naval Operations. The chain also alludes to the Admiral's service as Commander of U.S. 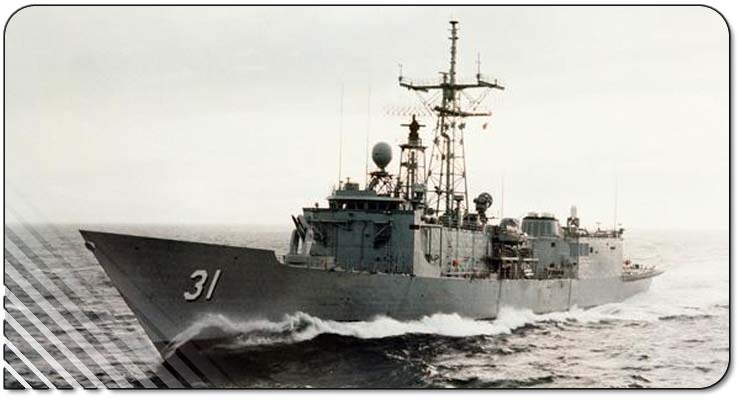 Naval Forces in Europe where his diplomatic and tactical abilities proved that the Navy was the vital link, which ensured support for Allied Forces ashore by convoying supplies from the U.S., and transporting of Allied Troop Replacement Forces. The anchor and the four blue stripes on the pentagon reflect Admiral Stark's forty-year Naval career, culminating as Chief of Naval Operations, and Commander of U.S. Naval Forces in Europe during World War II. The four stars reflect both his rank and the three Navy and one Army Distinguished Service Medals he earned during his illustrious career.